I am soliciting your help here, because one of my neighbours appears to have placed a crucified rabbit as part of their Easter decorations. 2. 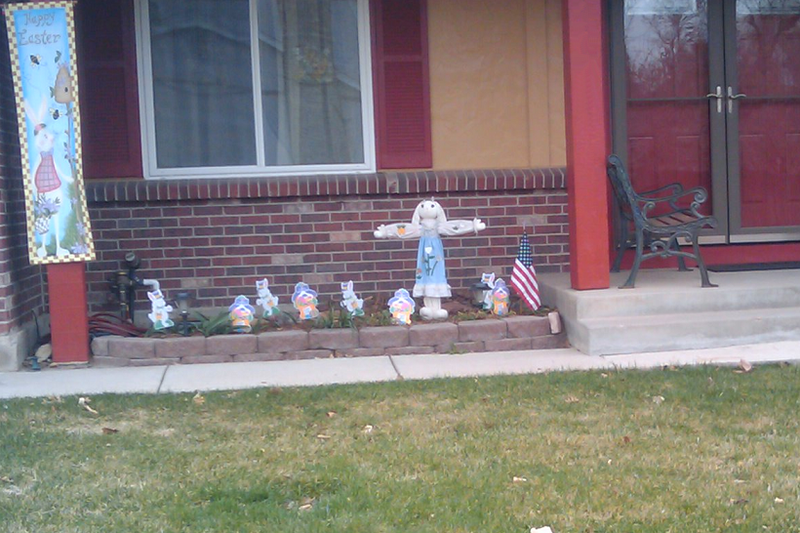 Does crucifying the Easter Bunny miss the point? 15.04.2009 - 7h33 Crucified rabbit? It seems so inappropriate, considering the holiday is based on the resurrection of a lamb... I mean of a man... no, god-man hybrid. It really doesn't embody the spirit of the holiday; they should have nailed him up on Good Friday or something, and taken him down for Easter. That crowd of revelers around him doesn't help much either. Still, that's not the most unsettling thing about this image. That banner next to the grisly crucification display tells an unfortunate tale. A cardigan-sporting hare is walking along, with his basket of sundries (and grass for some reason) when he looks up, realizing in horror that he has fallen into a trap. A hive of vicious, and surprisingly large bees! Knowing that should they decide to attack he would not survive, he edges out of frame, his inquisitive nose, cold with fear. And lo, one of them is already flying stinger-first at him ready to strike! Has Easter become a holiday for rabbit hate?! Or are your neighbors just horrible people? 15.04.2009 - 1h04 That's kind of what I was thinking--that perhaps the crucifixion itself was not really the focus of Easter, though I admit I am not exactly familiar with the details of the commemoration. 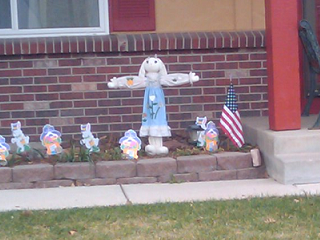 I had not considered the banner, except for the odd juxtaposition of "Happy Easter!" with the Crucible-esque scene of cavorting fellow forest-creatures dancing about the feet of the blank-faced and dead-eyed crucified easter bunny who appears--for some reason--to be dressed for a barn-raising. You're right, in that this is a somewhat terrifying tableau, redeemable only in the comparisons to the Nicholas Cage epic The Wicker Man the menacing bees may inevitably draw. My photo also leaves off the mailbox, adorned with a rabbit slumped rather boozily atop it. I would venture to say there is something subtly "off" about the entire scene. Perhaps it's just the neighbours, then. 15.04.2009 - 1h48 When your neighbors can be compared to the people of Summersisle, it may be a sign to start looking at a change of venue. Oh, and thank you for reminding me of the whole thing at the end.. I had forgotten that particular nightmare. All through the end (and for much of the next week) I thought: HE CHECKED IT EARLIER! WHY WASN'T IT ::redacted for spoilers::? !